We are a leading Manufacturer of ptfe coated fiberglass belt and ptfe coated fiberglass fabric self adhesive from Chhatarpur, India. Shree Sai Enterprises offer a comprehensive range of advanced performance belts having all inbuilt properties of the basic material, PTFE and fiberglass. The following superior characteristics of our belts result in increased productivity, savinglonger life and lower operating cost. 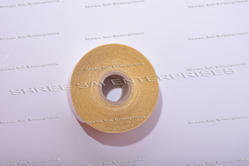 Shree Sai Enterprises manufactures PTFE Coated Fiberglass Fabric Self Adhesive for temperature resistance up to +260 Degree C. This tapes are used in sealing of polymer film in FFS, Impulse sealer, Band Sealer and Bags making machine. During this operation the plastic film is hot and sticky and the operation is made more efficient, if the sealing bars are covered with the strips of the PTFE coated glass fabric and PTFE coated glass fabric one side adhesive, which is a very good heat conductor and gives non-stick surface. Our MC 5NP OSA tapes are normally used in this application.